Hello and happy July 1st! Can you believe this year is already half over? I can't but looking at the bright side, with a new year approaching comes the chance for new beginnings. I don't know about you, but I love trees. Big trees, small trees - all types of trees. I especially love to see a grand old tree all by itself in a field. Trees inspire new beginnings for me as well as the ability to change. 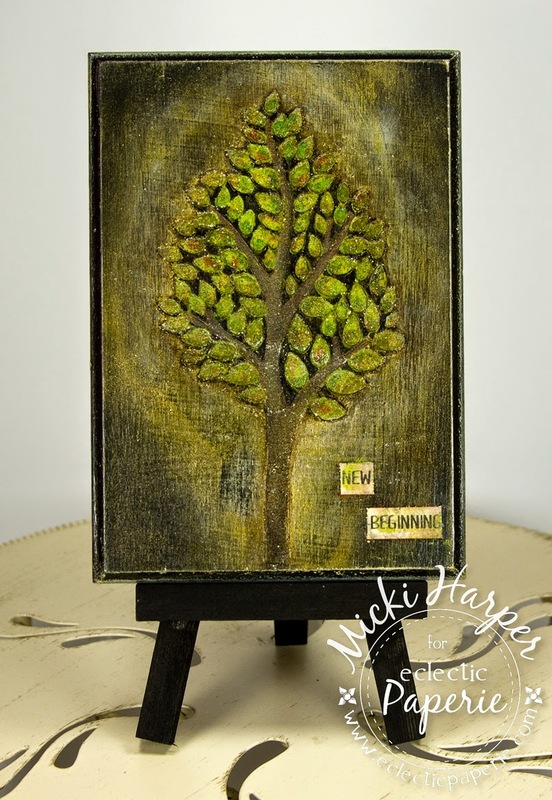 So I decided to create a little wooden plaque using Wendy Vecchi Studio 490 Layered Tree Stencil with her awesome sauce Embossing Paste. Some time ago I had purchased those cheap wooden plaques. This one measures aproximately 3.5" x 5" and I paid less than a dollar for it. First thing was to put a coat of Dina Wakley's Black Gesso down. Once dry, I mixed some of Studio 490's White Embossing Paste with some Paints. Here's a tip: Next time you are at a thriftstore or yard sale and see mini cupcake pans - grab them. I started using these to mix paints and especially embossing pastes! I didn't take pictures of mixing the paints and embossing paste, but it's like your cooking. A little of this - a little of that until I liked the color. Adding the embossing paste through the stencil was a two step process. I did the leaves first and let that dry. 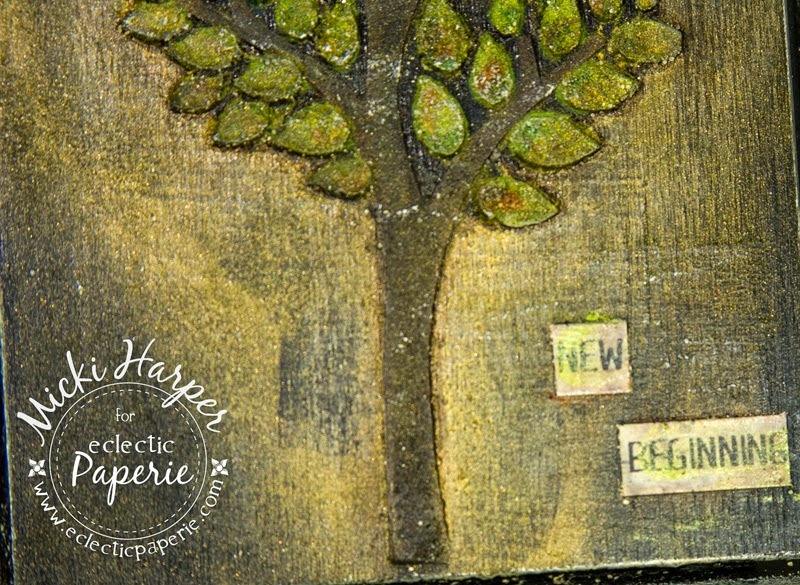 Next I mixed some more embossing paste with paint for the tree trunk which was then added through the stencil. I'm always afraid I'll mess up when laying down stencils and pulling the stencils up. And because I had mixed up just a wee bit too much and had some left over, I added the rest to piece of white card stock to be used in collage or in my art journal at another time. This time, it turned out! You'll notice that the colors are pretty flat - so I lined the stencil back up with the leaves, adding some tape to make sure it stayed put. Using my finger, I added Splash of Color - Silks Acrylic Glazes in Key Lime and Olive. After carefully removing the stencil, I used my Heat It Craft Tool to help speed the drying time along. Next I mixed Black Soot and Frayed Burlap Distress Paints on my Craft Sheet and using Dina Wakley's #4 Round Brush, aligned the stencil over the tree trunk and tried to add some dimension so that the trunk didn't look so flat. Then I decided to add dots of Ginger Peach and Sunflower Splash of Color Silks Acrylic Glazes with the brush and while it was still wet, sprinkled some Dristress Rock Candy Dry Glitter over the whole piece. I could have stopped there but I ended up brushing some of Sunflower Silks Acrylic Glaze around the tree, followed with some white paint, which kind of mixed with the glaze. I kept adding layers of glaze, going back and forth between adding, smudging and/or removing with a baby wipe. I lightly sanded the surface with Tim Holtz Idea-ology Sanding Grip because the wood was a little rough (baby wipe kept getting snagged). Using Faber-Castell Big Brush Markers, I filled in the edges of the tree - to hide some of the white and to add more dimension. Can I just say.... I LOVE those markers!!!!! It never ceases to amaze me how these markers will finish a piece. I used a sticker, which was cut apart, from 7 Dots Cold Country Word Sticker collection. Generally I always doodle around stickers with a black pen but this time I just swiped my wet brush through some of Silks Acrylic Glazes left over on my craft sheet and brushed it over the stickers to tone down the whiteness of the sticker. Inka Gold was rubbed around the edges and Matte Glue N Seal was used to seal the entire surface and that was it. I wanted the beautiful tree to be the main focal point which is why I didn't add any extra stenciling or stamping on the background. I love how this turned out - simple, yet lots of shimmer and shine and a wonderful daily inspiration! I hope you enjoyed this project and came away inspired! vintage with texture = awesome! Oh dear.... Wow !!! What else to say... ?? It's amazing. You truly turned that wood plaque into something very special. LOVE the result !!! Wow! 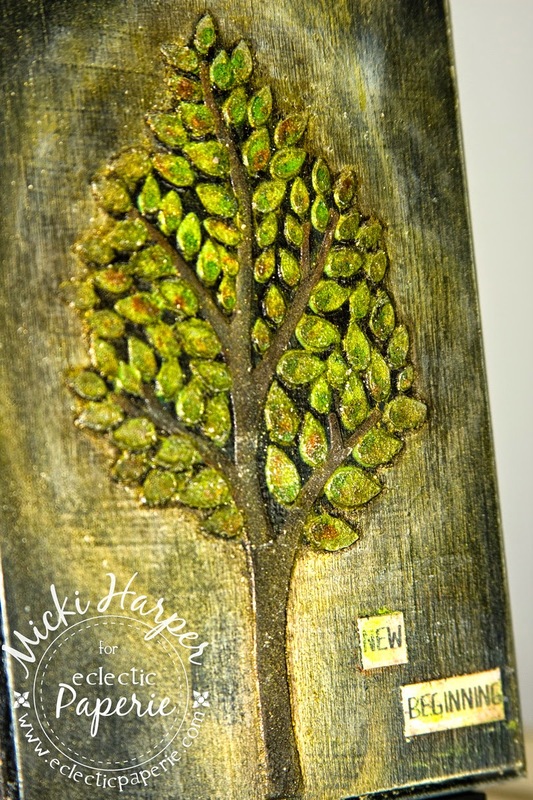 love the thickness of the paste on your gorgeous tree Micki! Great coloring on leaves and tree! Micki this gorgeous! I love all of your layers and textures! TFS!